A lover of architecture since childhood, Medardo Cadiz is the founder and CEO of Cadiz International Architects – an award-winning design firm with over 100 employees stationed in headquarters in Dubai, Seattle, and Manila, and a running portfolio of projects and master community developments spread across 16 countries including the Bur Juman Centre, award winning Al Hamra Mall, Manar Mall and Old Town District in Ras Al Khaimah, Lakeside Residence in Jumeirah Lakes, among others. Ras Al-Khaimah - Senior business leaders representing some of the world's biggest global retailers have expressed excitement at the business opportunities that will be created through the redevelopment of Manar Mall, after construction work began earlier this year on the AED230 million expansion project. The new development includes a spectacular waterfront retail promenade overlooking local mangroves and a brand new entertainment centre. Work on the 30,000 square metre expansion project commenced on 16 April 2015, and Barry Ebrahimy, Head of Commercial at Al Hamra Real Estate Development , said the expansion of Manar Mall continued to generate huge interest from tenants looking to take advantage of new space. Demand for existing retail space was also high, he said. "Despite the fact that we had already received expressions of interest for the majority of the new leasable when the project was announced, we have continued to receive large volumes of enquiries. Some of those enquiries include major global fashion brands and discussions are ongoing. We are also pleased with how are plans are coming together in terms of ensuring space left by tenants moving to the promenade is filled," he said. Leading international retail franchise operator M.H. Alshaya Co., which currently operates 8 brands in Manar Mall - H&M, Next, Milano, Dorothy Perkins, Mothercare, Claire's, MAC and Pinkberry - has underlined its ongoing commitment to the Mall. "Alshaya will be opening its pharmacy brand Boots in the Mall later this year, and is looking at further food brands in the future," said a company spokesperson. Alshaya operates over 2,800 stores across diverse customer sectors, including fashion and footwear, health and beauty, food, optics, pharmacy, home furnishings, and leisure and entertainment. Alshaya's portfolio includes some of the world's most recognised retail brands, including Starbucks, H&M, Debenhams, American Eagle Outfitters, and Victoria's Secret. "Our aim at Novo Cinemas is to provide the ultimate cinema experience and part of that means securing prominent locations for our entertainment centres. As the most popular shopping and leisure destination in the northern emirates Manar Mall fits the bill, and as populations continue to grow, its expansion has the potential to create opportunities and increase footfall, creating synergies between the retail and entertainment industries." "In Ras Al Khaimah there are a lot of smaller malls right next to each other. Even though some are half empty, more malls keep springing up. I can't see the logic. Expanding Manar Mall and having everything in one place makes much more sense and the new stores are very exciting. I'm sure my kids will enjoy the waterfront area too," she said. The expansion and refurbishment of Manar Mall was designed by Cadiz International, one of the world's foremost shopping mall architects, with Shankland Cox Ltd appointed as lead consultants. Following completion of the project, scheduled for the third quarter of 2016, net leasable area at the mall will rise from 30,000 to 60,000 square metres. Al Hamra Village is the flagship master planned development of Al Hamra Real Estate Development , which is fast becoming one of the UAEs most significant real estate developers. Al Hamra Village is a luxurious integrated community, located in Ras Al Khaimah on the shores of the Arabian Gulf, offering laidback oceanfront living approximately 45 minutes from Dubai the world's busiest airport. The development covers an area of 77 million square feet and includes 1.5 kilometres of pristine beach, over 1,000 villas and town homes, nearly 2,500 residential apartments, 5 hotels including the legendary Waldorf Astoria, an 18-hole golf course, a marina, and a shopping mall. Al Hamra Village offers investors a unique opportunity to purchase freehold property in the emirate. Manar Mall is the first and largest shopping mall in the Emirate of Ras Al Khaimah. Situated in the heart of Ras Al Khaimah, Manar Mall has a current built-up area of 30,000 square feet and a gross leasable area of 30,000 square feet. The mall has a capacity of over 100 retail outlets, featuring a comprehensive array of entertainment and dining facilities, along with an extensive parking facility with over 2,200 car parking spaces. Manar Mall is developed and owned by Al Hamra Real Estate Development , a leading real estate developer and master planner in the Middle East. "Medardo T. Cadiz - Architect"
Feature profile article on Medardo Cadiz, CEO of Cadiz International. Originally published in Illustrado Magazine: Oct-Nov 2013 issue. Click on the title to view the article. "Medardo Cadiz - A Gracious and Principled Commander"
An article written by Edson Cabalfin. Originally published in BluPrint Magazine: Vol. 2, 2013. Click on the title to view the article. You can say that Nina Quintos has built a career for herself as one of the top architects working in the Middle East and Southeast Asia brick by brick. With a career that spans more than two decades, Nina has carved out her own trail in a man’s world and has come out on top. “This is what I’ve always wanted to be,” said Nina Quintos about her being an architect. As project manager for Cadiz International, Nina, 46, has managed several significant projects in the Middle East, such as the Al Hamra Mall in Ras al-Khaimah, which won the prestigious Design Merit Award from the ICSC MENA (International Council for Shopping Centers, Middle East and North Africa Region) in 2011, for the Design of a New Shopping Center. A graduate of the University of Santo Tomas, Nina’s 22-year career in international concept architecture evolved as a result of her drive to become the best she can be. Currently, Nina is the project manager for several Master Plan projects — which she emphasizes are team efforts — such as the Lausanne Golf Village, a 250-hectare integrated residential development in Kyrgyzstan with a championship golf course, a commercial area and a hotel; and the 20-hectare Uptown Tbilisi Mixed-Use Development in Tbilisi, Georgia, which will have a retail mall as well as office, hotel and residential tower developments. Nina has built a career as impressive as the structures she plans. But being a woman professional in the Middle East and a Filipino also has its share of difficulties. It’s not just for fun and exercise, either. The Manila Dragons are competitive, and in fact took the Diamond Cup at the Hong Kong “King of the World” International Dragonboat Race in October. Said like a true global creator and trailblazer. "Medardo Cadiz: Rising Above the Challenges"
A profile article on Medardo Cadiz, CEO of Cadiz International. Written by Sherry Tenorio. Originally published in Illustrado Magazine: 28 Nov 2010. Article excerpt below. Armed with a strong global design perspective and commendable professionalism, Architect Medardo Cadiz led his firm to almost four decades of continued international success. His perceptive strategies have been shaped by experiences gained in the 80s construction bubble in the United States (US), the late 90s Asian crisis and the recent global economic downturn. In an exclusive interview with Illustrado, he reveals deep-rooted discipline and practical philosophies that allowed him to break foreign ground. After securing an Architecture degree from the University of Michigan, Medardo worked in various firms across the US. His global exposure started when he joined the renowned Design International – where his first international assignment took him to Jakarta. It was then that he realized the importance of having a global perspective. He also saw the opportunity in retail planning and the growing niche in mixed-use developments, for which there was a lot of demand in Asia and the Middle East. His subsequent decision to focus on Asia was a perceptive move since the states was already suffering from slowdown. So, using his more than ten years of global practice and his new found expertise, Medardo established Cadiz International in Singapore. MEDIA : Cadiz featured on Jakarta TV Show "Metro City"
TV Interview in Jakarta with Summarecon Agung Group introducing the architect for their projects. Medardo Cadiz talking about their design projects globally and highlighted the special design features of the Serpong and Bekasi projects. 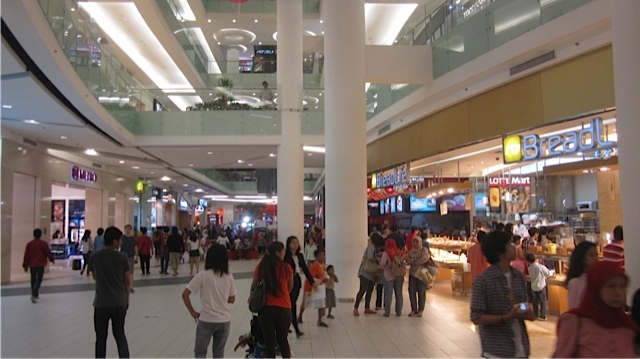 The Gandaria Mainstreet Mixed-Use Development opened its doors for the soft opening launch in August 2010, with over 500,000 square meters of GFA in the upscale district of Jakarta Selatan, Jakarta. The development is an important hub for economic growth in Indonesia, and captures the spirit, the life, and the buzz not only of Jakarta, but of the Main Streets of the world. Premier residential condominiums, luxury hotels, offices and a vibrant shopping complex and F&B create a “Living Street” of urban lifestyle and entertainment. Written and photographed by Arcadio Gonzales. Feature Issue on "Leisure by Design: At Home with Nature in Hamilo Coast." Originally published in BluPrint Magazine: Vol.2, 2008. Click on the title to view the article.